Thought I’d see what this 3D printing thing is all about. Turns out it couldn’t be easier! 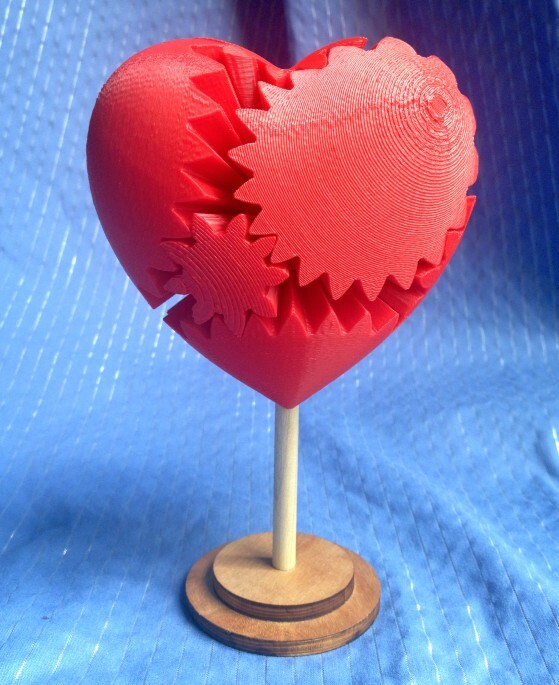 You choose a part from Thingiverse, such as a Gear Heart, download the model, load it into Makerware and just press print! I printed it on the Makerbot Replicator 2X at Techshop Pittsburgh, and it took about 9 hours. I’m impressed with how sturdy it is and how well the gears mesh. Time to design my own models! This entry was posted in Misc and tagged 3d printing, gear heart, techshop. Bookmark the permalink.